Today’s topic is yet another indie game, and yet another roguelike-inspired game, and yet another game that I will be praising for its satisfying difficulty. But having covered similar topics so many times now in this series, I would like to do something a little different with Cellar Door Games’ Rogue Legacy by discussing its implementation of remix bosses as an absurd (and, from my perspective, totally welcome) spike in difficulty. I have done this a few times in this series so far, primarily when covering games that have already been met with overwhelming praise by critics and audiences alike. In such cases, rather than throwing my praise on the praise pile, I try to offer something new, from a reading of the pixel art in FTL to a look at the atmosphere in Spacechem to a precise account of The Binding of Isaac‘s succession of The Legend of Zelda. 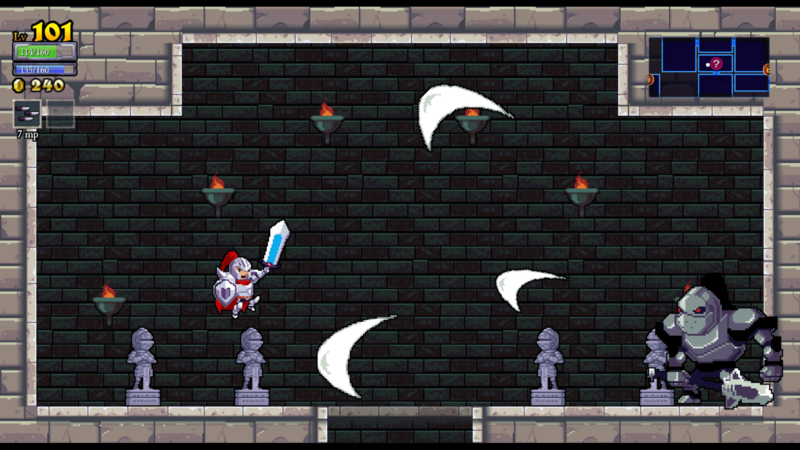 Today’s angle: Rogue Legacy‘s various remix bosses may be seen as a prime example of nonlinearity in the scaling of a game’s difficulty, which produces potentially unintuitive benefits for the player. Yacht Club Games’ Shovel Knight is a game whose Kickstarter campaign‘s success may be attributable to, above other merits, nostalgia for the SNES era of games whose aesthetics and gameplay Shovel Knight promised to deliver. It’s a winning formula, and one on which many other projects have been happy to capitalize: sell the gaming population its own childhood. Such projects, often full of wry nods toward and inside jokes from NES and SNES titles, wear the clothes of classics. They have pixel art as a matter of convention, and scrolling text as a matter of principle. But Shovel Knight is a special game, because it does not merely wear the clothes of the classics; it is a classic, every bit as deserving of acclaim and status as are the titles whose trappings got it funded. Derek Yu’s Spelunky first appeared as a freeware game in 2008, and it soon became a beloved piece of software for many gamers in the know (including acting as one of the two biggest influences on Edmund McMillen’s design for The Binding of Isaac). Yu then turned his attention (enlisting the help of Andy Hull under the Mossmouth heading) to a ground-up HD remake of Spelunky, and its release garnered a victory in the design category of 2012’s IGF, followed by PC Gamer naming Spelunky‘s Steam release their game of the year for 2013. That second accolade resulted in a lot of controversy, with gamers all over the internet commenting concerns about how a simple 2-D indie game could possibly beat all of 2013’s massive studio releases, with each franchise’s fans arguing their case. If you know me well, you’ve already got a pretty good idea of what sort of remarks I made toward those negative reactions. Mostly, I wondered whether most of those commenters were merely judging the game by its cover art, as it were, and had not actually played the game. As it stands, I would not only concur that Spelunky was the best game released in 2013, but I would go yet further and say that Spelunky is one of the best games I have ever played. To explain why, I will now compare Spelunky to the original Super Mario Bros. games. Two weeks ago, your Mid-week Mission was Super Crate Box, a simple, pixel art title carefully constructed around one innovative game mechanic. This week I would like to talk about a game with an even simpler art style, which is built around a less innovative mechanic—Terry Cavanagh’s VVVVVV. And yet, for all of the utter simplicity in its visuals and gameplay, this title manages to be one of the five best platformers I have played in the last five years, and one of my top ten platformers of all time. VVVVVV is a game whose aesthetics leave everything to be desired, but which uses its sparse, sometimes-baffling visual presentation (in conjunction with Magnus Pålsson’s anachronistic chiptune-esque masterpiece of a score) to set an incomparably other-wordly mood plucked straight out of 1980s video game logic. Meanwhile, the deservedly lauded level design ties the project together for a respectably challenging campaign. For more on why and how this game looks so odd and plays so wonderfully, keep reading.